The 270-WQ-COND Conductivity Sensors are suitable for measuring conductivity in a wide variety of applications including laboratories, streams, rivers, and groundwater. The conductivity sensor's small size and rugged housing make it useful for hand held measurements or permanent installation. The conductivity sensors use a 4-electrode measuring technique that provides accurate readings over a wide range of conductivities and temperatures. Because the conductivity of ionic solutions increases with increasing temperature, a temperature sensor is also incorporated and is used to provide automatic temperature compensation of 2%/°C normalized to 25°C. An in-line interface module converts the digital conductivity sensor and temperature data into two separate 4-20mA signals for monitoring with data loggers and PLC devices. 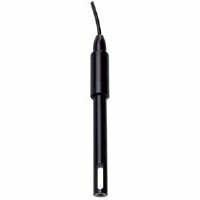 The standard conductivity sensors come with three feet (one meter) of cable between the conductivity sensor and interface module, and 25 feet of marine grade cable for connecting to recording devices. Additional cable can extend the length of the conductivity sensor up to 500 feet. Available conductivity ranges are 0-200µS/cm, 200-2000µS/cm, 2-20mS/cm, 20-200mS/cm and 200-2000mS/cm. The conductivity sensor's temperature output has a measurement range of -5 to +70°C.